The teaser trailer for this Shane Black production didn’t wow me, at all. Then the first trailer came out and a red band one at that. That one was an upgrade but I was still on the fence. They’ve released more teasers, international trailers and tv spot and, once again, I was still not fully sold on the film. Today 20th Century Fox drops the final trailer for The Predator just two weeks from it’s release date of September 14. This just days after the studio confirmed that the film will be a very hard R-rating raised my interest level. It is this final trailer (again another red band trailer) is what finally sold me on this film as a must-see. We still know only bits and pieces of what the film will be about but the trademark Shane Black quips and smartass attitude shows up much more clearly with this last trailer. I actually enjoyed the last Predator film and I hope this one continues the trend and just entertains it’s audience. “Found footage” films have become all the rage of late. Many attribute this to the extreme popularity of the Paranormal Activity films of the last couple years, but I like to think it goes even farther than that. Even before the aforementioned horror series we got the found footage horror of both the Spanish horror series [Rec] and it’s Americanized version with Quarantine. One thing which we haven’t gotten to see use this style of storytelling is the superhero genre which still continues to go strong. Filmmaker Josh Trank and screenwriter Max Landis (Masters of Horror: Deer Woman) solve this lack of superhero/found footage film with their surprisingly well-made Chronicle. The film begins with one of three high school seniors, the shy and troubled Andrew (played by Dane DeHaan), testing out his new video camera. We learn through this first ten or so minutes of the film that his only friend in school is his own cousin Matt (Alex Russell) and that his plans for the new camera is to videotape everything that goes on through his day at school and at home. We learn much about Andrew during these first minutes of the film. We see that his home life consists of him worrying about his very sick mother and trying to avoid the wrath of his drunken, abusive father. School life is not any much better as he’s bullied by other classmates and seen as a non-entity by the rest outside of his cousin Matt. It is his cousin who invites him to a rave party in one scene which will lead up to the two meeting up with a third high school senior, the very popular Steven (payed by Michael B. Jordan), and their discovery of something strange in deep in the woods. We never get any full explanation as to the origin of the mysterious object the three teens find underground, but all we know afterwards is how it’s given Andrew, Matt and Steven the ability to move things with their minds. This new found ability is just the tip of the proverbial iceberg as all three learn more about their new found powers. Matt figures out that their power is like a muscle and constant use just strengthens and enhances what they’re able to do. All three react to having superpowers as all high school teenagers would when confronted with such a situation: they become giddy boys behaving badly. They test out their powers on the unsuspecting public at the local mall parking lot and stores. It’s all pretty much harmless, teenage fun until an accident caused by Andrew shows all three the inherent dangers in their new abilities. Matt wants ground rules in how they use their powers with Steven following suit, but Andrew doesn’t understand why the need for them even though he’s remorseful of what he had caused. It’s the beginning of small cracks in the relationship between the three teens that would widen as the film moves into it’s second half with less joy and lighthearted fun and more darkness as one of the three begins to act out on his troubles both at home and in school. Chronicle could almost be a coming-of-age story in addition to being an origins story that superhero films seem required to do. We see Matt, the cousin, grow from being the wannabe intellectual into someone genuinely caring about what is happening to his introverted cousin Andrew. Steven, the popular football captain and student body president, learns more about Andrew and how he his new friend’s troubled upbringing concerns him enough to try and bring Andrew out from his protective shell and make him more confident about himself. With Andrew we see a teenager who many would feel much sympathy for. He’s the kid who symbolizes the turmoil a growing teen must go through both emotionally and psychologically. Whether it’s rebelling from familial authority or trying to survive the dangerous waters of high school life. We can see ourselves in Andrew’s shoes and his reaction to finally having the ability to fight back against those who have made his life a living hell feed our own fantasies as teenagers to be able to do the same. All of this would be moot if the film ended up being uninteresting, bland and boring. Fortunately the film doesn’t end up being any of those three. What we get is a fun and thrilling film which takes both the superhero genre and the found footage gimmick and adds some new wrinkles that combines towards a fresh new take on both. Found footage films have the unenviable task of convincing the audience that we’d believe someone would be lugging around a camera all the time and find ways to videotape every moment to create a believable narrative. It’s a leap in logic that will sink or swim these types of films. With Chronicle we see how their new abilities solves this particular dilemma in found footage stories. Being able to move things with one’s mind should make it easy to film yourself without having to hold the camera and instead have it floating and following one around. The film also does a great job in building up these characters into believable ones with their own back stories and motivations. We’re not left with basic cutouts of what we think teenagers are in films. Max Landis’ screenplay goes a long way in turning these three into real teenagers and their reactions in their new powers were quite believable. How else would teen boys react to finding out they’re now superheroes, but behave badly and use them not for the benefit of others but to have fun. The film could easily have gone the route of making them want to start helping others (though in Steven’s case he does try to help Andrew become more outgoing through the use of his abilities), but that would’ve felt disingenuous and unrealistic. Even the film’s dialogue seemed to flow naturally without having to resort to witty teen-speak that some writers think teen conversations are full of. It helps that the performances of the three actors playing the three teens came off as well-done. Dane DeHaan as the troubled Andrew comes off looking best of all three with his reactions to his own personal troubles coming off as real and not as some young actor trying too hard to try and impress. For a found footage film Chronicle does a great job in recreating the look and feel of the three teens superpowers. Whether it’s moving things around with their mind or flying through the sky, the film makes each and every act look like something that could happen for real. The scenes of destruction which encompasses the climactic sequence of the film look very realistic and on the small-budget (when compared to most superhero films) come off as very impressive. The technique of each scene being part of video camera footage (whether they’re handheld HD cameras or smartphone footages) allowed for whatever CGI-effect used to look seemless and not artificial looking. January and February have always been the dumping ground for films the studios either have little faith in or think don’t deserve the much more lucrative summer blockbuster and holiday season months. Chronicle manages to make its case that this would’ve been one film that could’ve done well playing around with the mega-budgeted blockbusters this summer and hold it’s own. It’s a film that takes a simple premise and creates something not just fun and exciting, but also takes a delve into the psyche of the teenage mind and all the pitfalls and dangers one can find themselves in navigating through it. 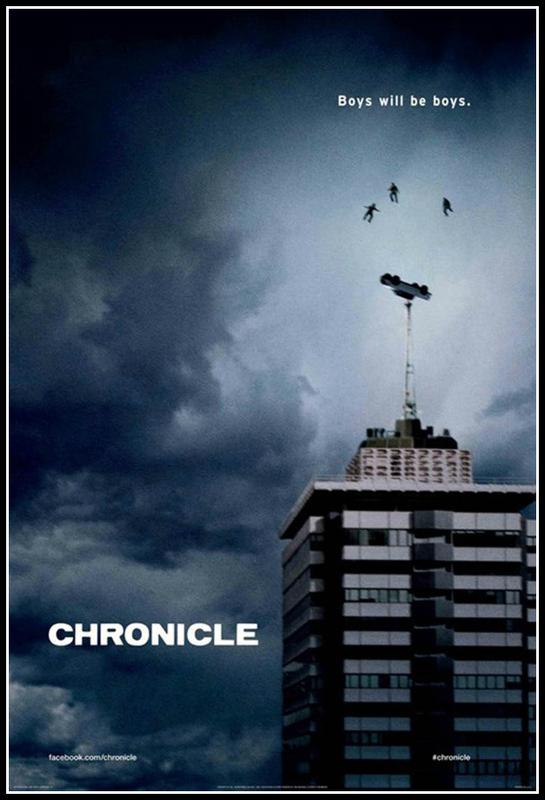 Chronicle is one of the better films in these early months of the 2012 film season and overall probably one of the better one’s by year’s end.